Well, my Niners are in the Super Bowl! For the first time since the Steve Young days, the 49ers are playing in the biggest single sports game in the nation. They survived a shootout with Matt Ryan and the Falcons with more than a few mind blowing mistakes by San Francisco that could have priced costly. David Akers’ inexplicable miss, Michael Crabtree’s goal line fumble, and the crumbling first half defense pointed to an Atlanta victory. But behind the workhorse legs of Frank Gore that wore down the Atlanta defense until the final whistle. Behind the dynamic speed-arm combo Colin Kaepernick, plow horse Frank Gore, and a ferocious defense led by Pro Bowlers Patrick Willis, Dashon Goldson, and NaVarro Bowman, the Niners are all set for a trip to Louisiana. Earlier in the year I said that you can’t make a quarterback change based on one game. Well, Harbaugh disregarded logic and the opinions of many people including myself, and committed to Colin Kaepernick. And now he looks like a genius. Kaepernick used his unique blend of lightning speed, a cannon arm, and a 6’4 frame to pummel the Packers in a 45-31 division round win. There was no question of if, it was always a question of when. I didn’t think that throwing an untested second year quarterback in front of a veteran with playoff experience and the best passer rating in the NFC made any sense as the Niners pushed for a playoff berth. But I was wrong. Kaepernick proved himself on a big stage, in a big game. He wasn’t necessarily clutch, because he beat the Packers so soundly he didn’t need to be. Kaepernick and the 49ers face another challenge next week, facing either the dynamic rookie Russel Wilson and human truck Marshawn Lynch of the Seahawks, or the air raid attack of the 13-3 Falcons. The defense will be a key factor in facing either of those two teams, but Kaepernick’s dual threat abilities really opens up the offense for Greg Roman and Jim Harbaugh’s play calling schemes. Kaepernick is an insane athlete, and a head coach’s dream in terms of athleticism and arm strength. But to truly prove himself better than his predecessor, he needs to take the Niners to the Super Bowl. 2 more games left in this postseason. It’s time to bring it. Also, you can now go directly to pigskinandpinetar.com instead of pigskinandpinetar.wordpress.com. Today, at 11 o’clok AM we learned who was going to make the 2013 class of Hall of Fame Inductees. The people who made it: No one. Not Bonds, not Clemens, not McGwire, not Sosa. So the writers and the baseball officials put off the ever-looming steroid question for another year. But it’s much more than that. These players were great, some of the greatest of their era. But they cheated. Think about how dynamic Barry Bonds could have been if he had kept that electrifying speed he had on the Pirates and hadn’t decided to bulk up. He made a mistake. So did Roger Clemens, winner of a record 7 Cy Young awards and the greatest pitcher of the 90’s, with the possible exception of Randy Johnson. But he got old, and he got scared, scared that he couldn’t keep up with the Young Guns as he entered his late 30’s and early 40’s. Which was mistake that could cost him the Hall of Fame and irreversibly tarnished an otherwise sterling career. So he decided to cheat, like so many others. But if you let just one of these players who used Performance Enhancing Drugs into the Hall, it sets a precedent, much like a court ruling. If Bonds gets in, then Sammy Sosa will want in. He hit over 600 home runs. He hit 66 in a season. He and Mark McGwire single handedly brought back thousands of baseball fans. All valid points. All true. But he also cheated. And if one person cheats and makes it, all the others will want in too, and they do, in a way, have that right because if a steroid user makes it into the Hall of Fame, it sets that precedent. And suddenly you’ve got fans of the Big Red Machine from the 70’s saying Pete Rose got 4,000 hits WITHOUT steroids. So why should he be denied entrance, when he never cheated? The debate will go back and forth, once again,on how “He never bet on his own team”, and the old “That doesn’t diminish his accomplishments as a player”. If Rose ever does make it into the Hall of Fame, and I believe he belongs there, there should be no mention of his time on the manager on his plaque. If you really want to push it, people will throw it back to 1919, the “Black Sox”. Eight Men Out, that whole debate again. I belive Joe Jackson shoud be allowed into the Hall of Fame, regardless of his teammates’s actions. He hit over .375 in that series! Nobody hits like that trying to throw the series. The 2013 ballot and many more to come, will have baseball’s darkest times and darkest events rear it’s ugly head, after so many attempts over the years to bury these embarrassing and cloudy situations. Baseball experts and Hall of Fame voters will have to make a decision-and it could be one that opens the floodgates. 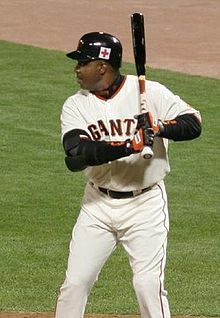 Credit for the image goes to http://en.wikipedia.org/wiki/Barry_Bonds. It is not my picture and all credit goes to the photographer and this website.